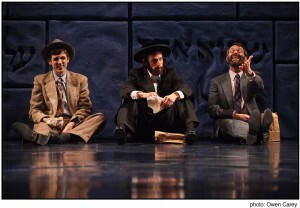 Chaim Potok’s The Chosen is among several productions this season at Portland Center Stage that are based on a book or had previously been produced as a movie. It’s an almost unavoidable reality for theatrical companies to pack their slate with plays that people are somehow familiar with in some way. Another unfortunate reality of modern theater is that the money available for productions has shrunken. Portland Center Stage’s artistic director Chris Coleman has embraced this fact and in many of his productions this season has worked with negative space and actor’s narrative or pantomime to fill the stage. This tactic worked extremely well for Ragtime and Snow Falling on Cedars but fails miserably with The Chosen. Based on Chaim Potok’s award winning book about two boys from opposite sides of the Jewish spectrum (one Hasidic and the other more secular) whose worlds literally collide with each other, The Chosen is a compelling tale that weaves interesting themes about life, relationships and religion. While the themes in The Chosen eminate from Judiasm and Jewish text, they are in many ways universal. Aaron Posner’s adaptation seems to be more interested in discussing the themes of Chaim Potok’s book than focusing on the characters. The play is hamstrung by painfully long monologues which are more in service of communicating ideology than moving the story along. Posner’s adaptation also relies on a device which really doesn’t work here: a grown-up version of one of the main characters (Reuven Malter) narrates the story of how he met and befriended the Hasidic Danny Sanders. This narration constantly takes focus away from the actual characters on stage and makes the play extremely choppy and disjointed. We live less than the time it takes to blink an eye. The blink of an eye is nothing. But the eye that blinks, that just might be something. It’s a core theme to the play but it’s delivered so poorly that it feels limp in Rothman’s hands. As dull and off as John Rothman is, David Margulies, who may be best known for his role on The Sopranos, was simply electric. Just as the first act seemed to be losing some steam, Margulies lit up the stage with a larger-than-life portral of Reb (Rabbi) Saunders. But even Margulies’ delicious performance couldn’t save him from the choppy and undisciplined text. His opening monologue goes on so long it loses all the magic and energy that it starts with. Also putting in solid performances are Carter Hudson as “Young” Reuven Malter and Jonathan David Martin. Their chemistry as the two high school-aged kids whose worlds collide is one of the few things that holds this production together. Had Aaron Posner’s adaptation trusted more in these two main characters and their relationship, instead of trying to bolster it with a narrator, this would have been a much better production. One of my biggest disappointments with Portland Center Stage’s production of The Chosen is Chris Coleman’s staging. The starkness of this production overwhelms it. There are several scenes in which there is a clear need for other actors on the stage and their absence gives the production more a feel of a workshopped play than a full production. At several points the action on stage is split between two locations and it never really worked. But ultimately the staging is so stripped down and stark that it provides the audience very little to consume. When the play has its slow moments there’s nothing else there and this adds to one of the play’s biggest problems – it’s way too slow and way too choppy. The first hour of Portland Center Stage’s production felt like two and without much spark behind the concept and ideas presented in the play, I found intermission to be a time to stretch and get rid of my restlessness rather than embark in any debate or discussion with anyone. The second act felt equally tough and at the end I was happy to have made my way through it. It’s a shame – somewhere in Chaim Potok’s book is a compelling play waiting to be adapted, but this isn’t it. Also, I really hope this is the end of Chris Coleman’s experiment with space. I think it has run its course and it is time for Portland Center Stage to find its way back to some more concrete set pieces and casts. The theater of the mind is fantastic, but Coleman needs to remember I’m also paying to see theater on the stage.